This was my very first pen project backing on Kickstarter. 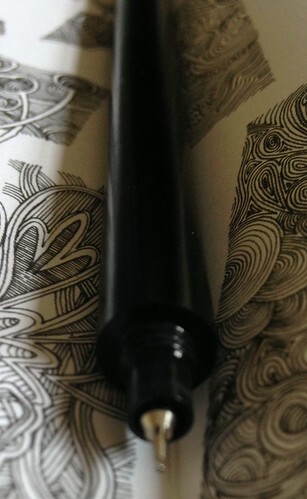 I am planning to do a article around my experiences with purchasing pens via Kickstarter in the coming weeks. For me this pen is all about the looks. It essentially is a really high end upgrade on the standard cheap plastic body of the Hi-Tec-C. The body of the P1 is made from machined aluminum which makes this a very durable but also a light weight pen. The cap is a small but practical screw on and off. The cap can’t be posted and with it being small it could potentially be easy to lose (Thankfully I haven’t!). The P1 does come in a variety of colours but I went for the anodize black version. Comparing it with a store bought Hi-Tec-C body they are very similar in width and length. With the cap it comes in at 13.7cm in length. Without the cap it is 13cm in length. All you have to do to change out the refill is unscrew the pen at the base. It only takes one style of refill, it is the Hi-Tec-C. There is no real point me going into the performance of the refill as this review is really about the barrel. I would like to report that other backers including myself have been suffering from ink flow issues. It does seem to take a few minutes to get the ink of the refill flowing or it evening randomly stops working all together. I have tried another refill but still find I have the same issues. Its been suggested that there could be a lack of airflow through to the refill as the base and cap are screwed into place. The Cost and is it worth it? Including shipping I paid $50. I think it has been a great experience purchasing a pen from Kickstarter and as I said at the beginning I am planning to do a detailed post on my experiences with purchasing pens from kickstarter. The P1 is a stunning looking pen but with the ink flow issues I continually have I can’t recommend which I find really sad. If you own a P1 I would love for you to leave a comment on your experiences with it.